Most small businesses that sell any kind of product will require a good digital camera. Digital cameras are essential items for making consumers aware of products and updating website images. With digital cameras the results are there to be seen immediately and wireless enabled cameras can download straight to your own computer. Digital cameras are essential within many different business sectors. Almost every picture you see on the Internet has been downloaded via a digital camera. The results are instantaneous with no loss of picture quality. Websites that promote businesses services can be updated immediately using digital photographs. Business presentations would be a lot less exciting without the integration of digital photography, and there is no need for professional photographers to take those staff photos. It is almost impossible to think of business that does not have some form of photographic requirement whether photographs are actually used as an integral part of the business or for advertising. Where cost is concerned it does make sense to invest in a good quality digital camera rather than hire a professional photographer every time images are needed. Junior members of staff will usually leap at the chance of learning and using a digital camera. But in most cases the cameras are user friendly and it is hard to take a bad picture with them. Your digital camera requirements will usually be based on what you will actually be using the camera for. If off-site workers are going to be taking pictures to send back to the office then a convenient compact model would probably be sufficient. If photos are intended to update websites on a regular basis then high quality cameras with a medium megapixel count may be needed. Good quality digital cameras do not need to be expensive, although a professional digital single lens reflex (digital SLR) can cost around a thousand pounds. Megapixel count; the higher the count the better although 5 to 7 is best for emailing and website pictures. Optical viewfinders are better for framing shots although many people prefer LCD viewfinders. Zoom lens; optical zooms are preferable to digital zooms if you require good detail. Go for an autofocus lens to avoid blurring of pictures. Image transfer capabilities including wireless if available. Most cameras will come with a cable to hook up to a PC for transferring digital photographs. This is not exactly a quick way to transfer pictures compared to other methods but will get the job done. 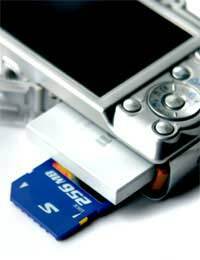 Some printers will also have memory card readers which again will make transferring to print easy. There are now wireless enabled cameras that can transfer digital photographs immediately to computer via a wireless network. Wireless cameras make transferring, printing and sharing photographs a breeze, and there is no loss of quality. It is the same method that people have been using for a while now with mobile camera phones; except to a much higher quality standard. Wireless enabled cameras should not cost that much extra and Bluetooth enabled cameras are also available. Digital cameras are inexpensive, convenient, easy to use and can give professional results. They are vital pieces of technology for most businesses, and good images can enhance a business website. Always shop around and compare prices before buying as some very good deals can be found on photographic websites.